Have you ever wanted to know more about what you feed your bird? And what would happen if you adjusted the diet? Well, ZuPreem has come up with a great new site called BirdFoodFacts.com that calculates the content of your bird's diet for you! On the home page, first you pick the species of your bird. This is important since different species have different nutritional requirements. While the list of birds is far from comprehensive, it does include most of the common species or species groups, such as cockatoos, macaws, Amazons, African greys, cockatiels, budgies, and others. After you pick a food item, it asks you to enter the percentage of the diet this item represents. Once you've entered one item, go up to the main menu and pick the next item to add. Repeat this until you've entered the bird's total diet. Your birds may not get the exact same diet each day, so try to pick a sample diet. Not all treat items are listed (though you can always request that they be), but these should not represent a significant portion of the diet or they wouldn't be treats. Note that there are many things on the miscellaneous list, in particular, that shouldn't be part of any bird's diet, like cheese puffs (salt! ), donuts (sugar! ), and iced tea (caffeine! ), but are included so that you can honestly evaluate your bird's diet. Once you have a list that adds up to 100%, click on the Analyze Nutrition button. 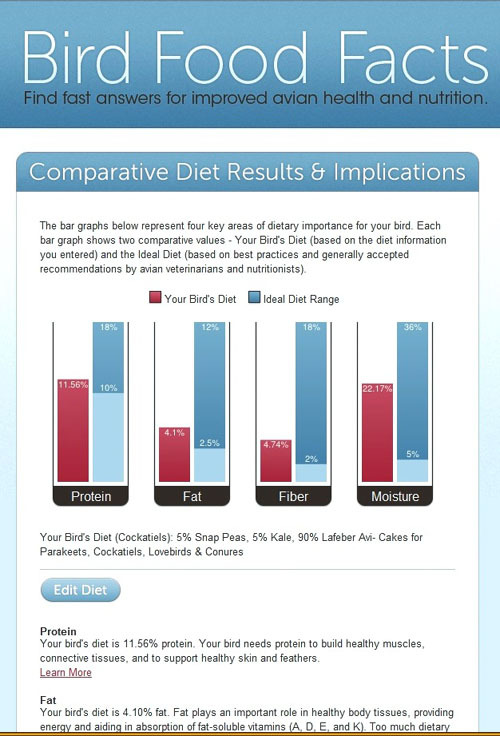 A screen pops up giving you comparative diet results and implications. There are four sets of bar graphs analyzing your birds' diet for protein, fa t, fiber, and moisture. These are compared against the ideal diet range for that species. Below that is a description of the role these four factors play in a bird's diet. If you click on "learn more", even more information comes up, with tips on how to increase or decrease that dietary element, as needed. Also included under Frequently Asked Questions are a variety of diet topics, including common medical problems caused by feeding, advise on food diets, seed versus pellets, foods to avoid, information on vitamin and mineral supplements, and how to deal with picky birds. Additional information available includes tips and directions on converting your bird's diet, find a pet food store/breeder/club/retailer near you, and learn more about avian health and nutrition. A disclaimer advises you that this information is only for adult, non-breeding birds. 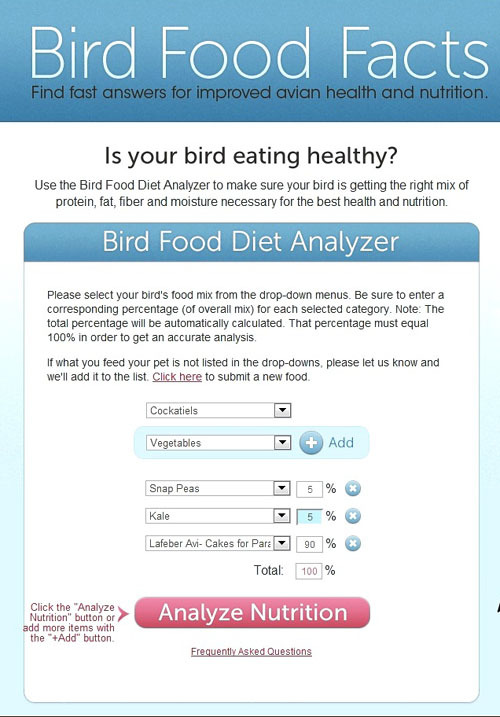 There is an "edit diet" button so you can make adjustments to see how revising your bird's diet can affect these numbers. While this site is sponsored by ZuPreem, that is not obvious, and only one little comment on the side mentions that they are the "No. 1 selling pelleted bird food brand in the U.S." The site is surprisingly free of commercial bias, with most major bird food brands represented. It would be nice to see vitamin and mineral analysis also in addition to the four categories provided, but the information on this site is quite useful. Perhaps this will be coming down the line. I strongly encourage everyone to try analyzing your bird's diet so you can see what you're really feeding your bird. Keep in mind that the percentages you enter are what the bird is actually eating, not necessarily what you provide. Also, with seed mixes, your bird may be picking out certain seed items selectively, so the analysis may not be totally accurate. And while that almond or grape may not look like much, it could be a bigger part of your bird's diet by percentage than you think it is, so try to be honest about what you enter. One of the best uses of this site is to compare diets so you can see what effect a change has, rather than just looking to see if the diet falls within range. So, for example, if I edit the diet above to be 80% Avi-Cakes with 10% French fries and 10% grapes, the diet is still within range, but the fat went up from 4.1% to 5.23%, and the protein dropped from 11.56% to 10.45%, indicating a diet going in the wrong direction. But if I had just entered this as the only diet, I might believe that this is a healthy diet, which is not true. So the lack of information on overall health of the diet, particularly with regard to salt, vitamins, and minerals, can be misleading. Still and all, this is a great new resource provided by the people at ZuPreem which will help all of us be more knowledgeable about what we are feeding our birds. I encourage everyone to give it a try!